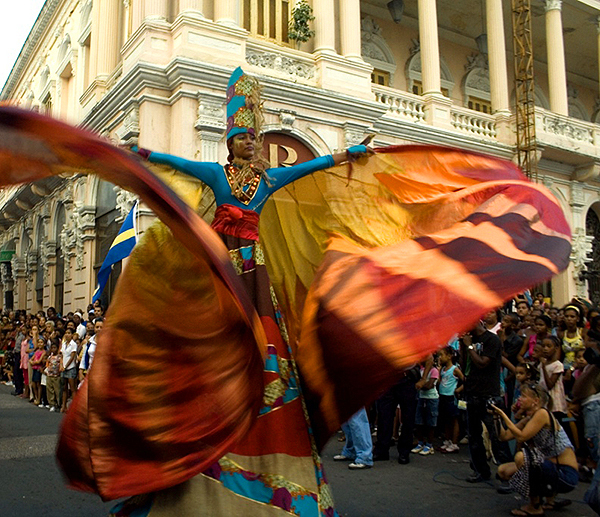 Since 1980, for one week every year in early July, Cuba’s 2nd largest city, Santiago, erupts in a wide-ranging celebration of Caribbean culture and history. The festival, known as both the Fire Festival and the Caribbean Festival, brings together artists, dancers, musicians, academics and partiers from around the world. The streets rock with revelers, while music, dance, and theater performances, art exhibitions, religious ceremonies, seminars and workshops take place at venues across the city. Food stalls and pop-up bars and restaurants fortify the crowds with traditional and nouveau Caribbean fare. Street markets feature regional art and crafts. The week of daily parades peaks with the Fire Parade on the last night, which ends with the burning effigy of the Devil. The Fire Festival is certainly a carnival, but it is not to be confused with The Carnival, another annual summer festival in Santiago, but with more specifically Cuban themes (taking place this year July 18-27, 2018). This entry was posted in Cuba, Holidays & Festivals and tagged caribbean festival, fire festival, santiago de cuba by yalla2013. Bookmark the permalink.